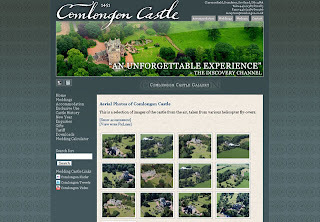 The existing Comlongon Castle website image gallery module was struggling to cope with the volume of images so it was time to employ a Wordpress installation with the renowned NextGen gallery plug-in to help organise the photos into themed galleries (AJAX pagination) with slideshow and piclens options. This is to be achieved using an alternative Comlongon Castle domain as a sort of mirror to the main site so that web visitors can switch between the two resources, with each resource being able to provide either text content and documents, or images. By extension, this could also be applied to video content - at the moment the Comlongon YouTube channel is in it's infancy but this is the ideal resource to host video content that links back to the main 'outcome' site, where web visitors can complete goals such as make contact or use the wedding calculator to generate a guideline wedding quote.